WriteMyEssay.com – Cheap Essay Before the Deadline? Colorful website design, big order form, clear instructions and a bunch of promises that can be found in the content itself. Everything tends to look pretty standard, as numerous other web pages of such services have almost the same appearance with a slight difference in colors and names. Still, writemyessay.com is not a standard essay writing service website. To say sincerely, it is very, very far from being standard. You might think you can get your cheap essay before the deadline obligatory here, but facts say it all goes the opposite: you won’t. Lots of words, numerous descriptions, loud promises… and NO estimate quote page available! At least, we couldn’t find it after some minutes of discoveries on the field of this website. Maybe, the system allows us to see the quite of the order after introducing an email. We tried, and got the lag. Dead end. No following info was displayed after providing this service with an e-mail address for the first time. The only thing we have seen was a colored spinning circle. Nice to meet you, writemyessay.com! OK! After the fifth try and 50 minutes of our time, we could see the required payment for our test order. So, the prices are actually not the highest, but we would prefer to pay more if to know the service could be stable in that case. 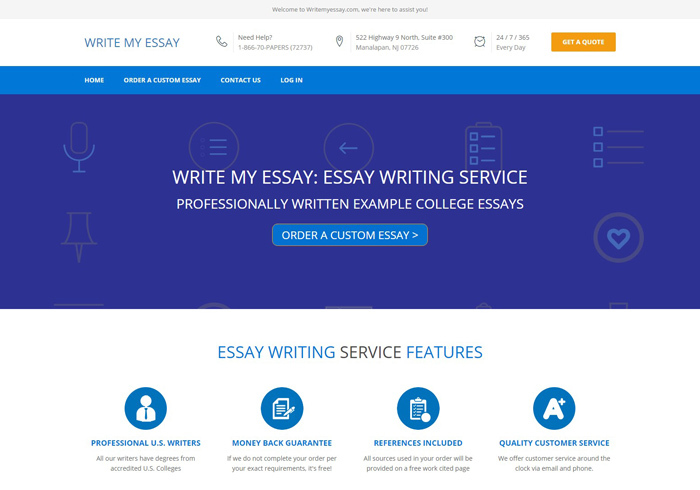 Looks like average market prices are the only doubtful advantage of this “Essay service”. No. Just no. Lagging pages, downloads that are long as heck, walls of “SEO-optimized” text (in fact, it is just filled with a bunch of topical keywords and contains nothing except of them), poor interface (those rainbow colors everywhere just drive us mad), and so on. Nothing positive to say. To say sincerely, we’ve met services with poor and lagging websites but good high-quality works delivered to clients. Unfortunately, WriteMyEssay does NOT belong to companies of that kind. Test order paper we asked them to complete was full of typos, misspells, and even grammar mistakes. It seems like their authors work in a constant rush and wish to cover the lack of own writing quality with the quantity of “finished” orders. As we all can understand, this solution is far from being suitable for any online essay writing service. If writers actually work in a hurry and can’t edit the completed order properly, we are sorry about them. But we can’t be sure in that fact, because the finished order was delivered to us 3 hours AFTER the wanted deadline, and only numerous reminding messages sent from our side helped us to get the paper. And what if the ordered work was actually urgent? Everything was said above. We can’t recommend this essay service for cooperation. If you need quality papers delivered in time and without issues, you better choose from a big variety of other companies. Writemyessay.com has nothing to do with a good high-quality service.